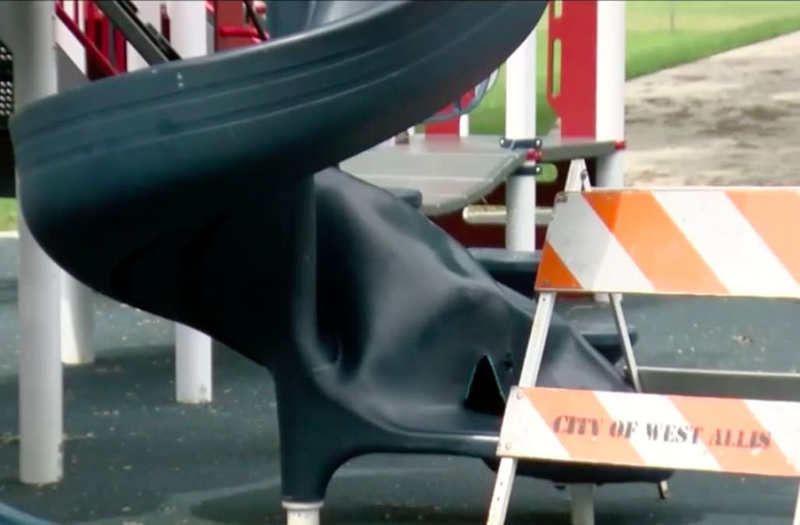 A 9-year-old boy allegedly received second-degree burns after a slide at a park in West Allis, Wisconsin, bubbled up and burst while he was going down it. Giuseppe Storniolo was at Reservoir Park on Wednesday evening with his parents and younger siblings when his mom, Diana Storniolo, says she heard a loud noise and became concerned. "I just heard like a big explosion, so I thought maybe something fell," said Storniolo. Storniolo eventually learned that, to her horror, the sound was the result of an exploding playground slide that her son happened to be using at the time of the incident. ​​​According to the family, the boy sustained second-degree burns from the malfunctioning equipment. Mayor Dan Devine says the city sectioned off the affected area and removed the dangerous piece of equipment on Thursday morning. Although Devine says he has spoken with the slide's manufacturer, Landscape Structures, to find out what may have gone wrong, the actual cause of the accident currently remains a mystery. "It was like the slide had just almost been inflated. It just opened up, bubbled," said Devine. "I don't know. It might be some kind of chemical reaction. It might be some kind of gas-plastic reaction." Not even Giuseppe has a clue as to what caused the strange explosion that left him injured. "I was about to get off and it just started to happen and it came up shaking," Giuseppe Storniolo told WISN. "I never saw any cracks on it, or no holes. But -- I don't know what happened." Devine says that the rest of the equipment at the playground has been tested to ensure its safety, including two similar slides made by the same manufacturer. He maintains that the explosion was a freak accident and doesn't believe there is any danger of a repeat incident. "I have never seen -- and I don't know of anybody who has seen anything like that before," he told WISN.